Most of this page has not been updated since 8 March 2010 due to finding too many lovely blooms; only the plots are being kept up to date through the end of the low desert season in mid-April. Picture taken on 23 February 2010 a few hundred feet past the end of the pavement of DiGiorgio Road, from immediately alongside the road. See also the larger picture showing the evil non-native Asian mustard, Brassica tournefortii, about to put an end to future displays like this here. As recently as 15 years ago, there was no Asian mustard here, and the native wildflower displays were much more extensive. Peak Bloom: What Does That Mean? The Borrego Desert is the northern part of Anza-Borrego Desert State Park below an elevation of ~3000 feet, named for the Borrego Valley and the town of Borrego Springs (map and expanded definition). 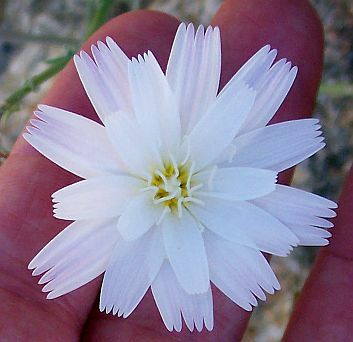 This page gives information about the 2009-2010 bloom for all species in this area, with emphasis on the annuals that are responsible for the widespread showy blooms that appear in some years on the desert floor. The date of the last update to this page is given at the bottom of this page. For the progress of last year's bloom, see 2008-2009 Blooms. 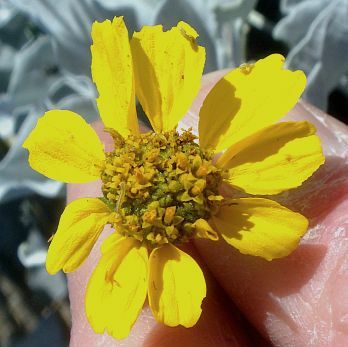 In addition to specific information about current conditions, this page also gives some general information on what is needed to germinate those annuals, and what is needed to sustain the annual bloom. 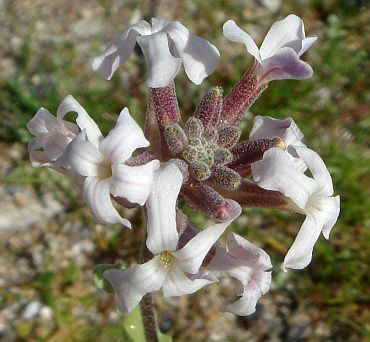 The information here is by no means a definitive list to what is blooming at all locations in the Borrego Desert; it only records the species I've seen in bloom on my trips that occur roughly every fourth day. 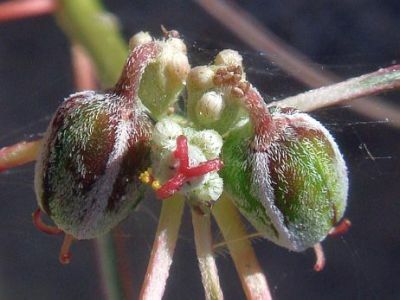 Because the locations change, the numbers of species in bloom, and the number of plants in bloom, cannot usually be directly compared from trip to trip. 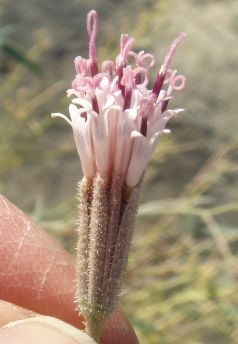 However, the information here will give the reader an idea of what the bloom is doing in the Borrego Desert. 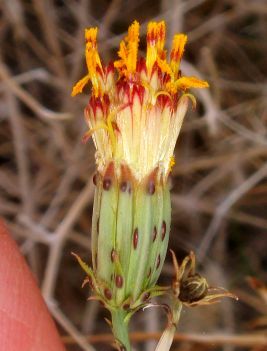 Note that there is often quite a difference in the annual bloom between the moister canyons west of Borrego Springs and the drier areas around the Badlands. Similarly, even within those canyons on the west, there can be large differences between the north-facing and south-facing slopes, and between canyons with permanent water, like Borrego Palm Canyon, and drier canyons. In the drier areas to the east, there can be large differences between the edges of washes and the middle of washes, and between shady canyons and open areas. 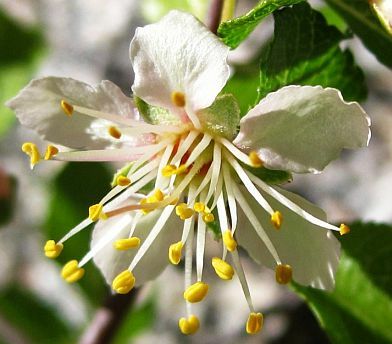 The locations for each hike are in the detailed reports below; more information is sometimes given in Botanical Trail Reports in Chronological Order, which usually includes more information about the bloom on each trip. In addition to desert stations, I've also given the rainfall from my house in Fallbrook, on the coastal side at 680 feet elevation, to show the large difference in rainfall between the wet side of the mountains and the dry side. Table 1 gives the storm totals, in inches, as of the last day of each storm. The storm totals were taken from the Weather Service Rainfall Storm Summary, except for Fallbrook and the Borrego Badlands / Ocotillo Wells. Occasionally other stations are missing in that report; if so, totals are taken from the Rainfall Summary Map. 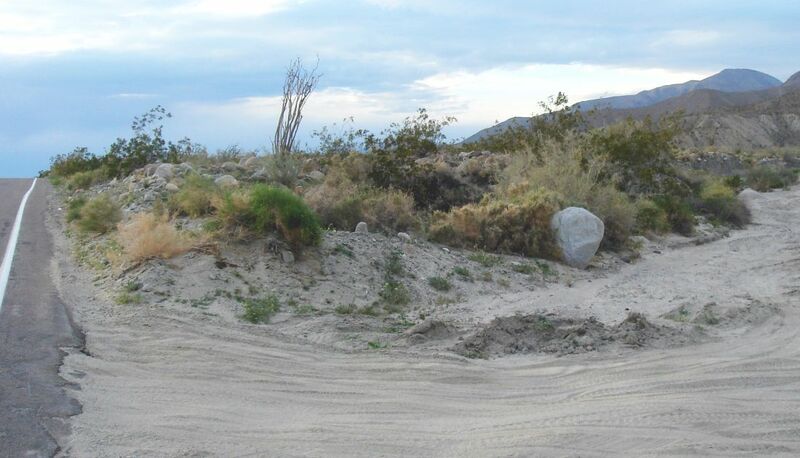 Rainfall reports for Ocotillo Wells are reported at here for the month to date. If a station didn't appear in the summary, or I couldn't find it elsewhere on line, I usually assumed the rainfall total was zero. Although this assumption is probably usually correct, it is not necessarily always valid since missing data plague all rain reports. In a few cases, when it was clear that some rainfall must have been received at those missing stations, I've guesstimated the rainfall. Note that the total rainfall at the bottom of the table is since 1 October, since rain that falls earlier doesn't germinate the desert annuals (see below). This rainfall total may be different from the rainfall reported by the Anza-Borrego Desert State Park Visitor Center using the normal California rainfall year that begins on 1 July. 27-28 February 2010 1.46 1.0?. 0.6? ~0.49? 0.49 0.? The rainfall totals for 5 March 2010 are incomplete for every location except Fallbrook. The reported rainfall of 0.34 inches for Borrego Palm Canyon on 12/7/09 is unlikely to be correct, since nearly everywhere in San Diego County received an inch of rain or more. Automatic rainfall gauges often get clogged, causing under-reported rainfall, which is probably what happened here. I've replaced it by an estimated 1.0 inches. On 2/13/10, the Visitor Center billboard reported 6.94 inches of rain, compared to the total above of 6.75 inches from the National Weather Service station in Borrego Springs, and my estimate of 7.12 inches from Borrego Palm Canyon, so my estimate was probably fairly accurate. On 12/31/09, the rainfall given at the Visitor Center since July 1, 2009 matched closely the Borrego Springs total rainfall given above since there was no monsoonal rain at the Visitor Center in 2009. 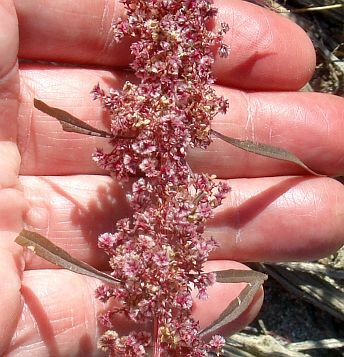 The timing of rainfall is extremely important for the annual bloom. Rainfall received in the summer and early fall will not germinate the annuals that bloom in February and March. 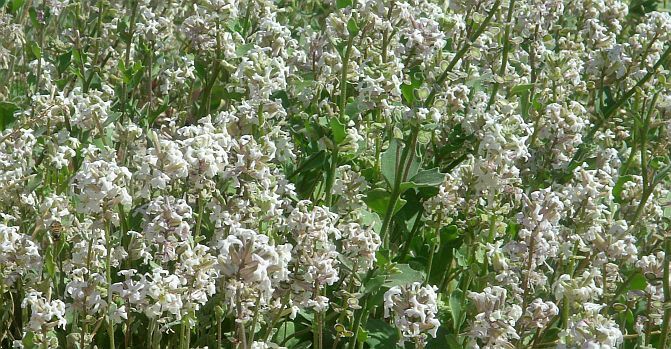 Rainfall received after January will either not germinate those annuals, or will germinate them too late for them to produce a robust bloom in most years. Thus rain must fall in October, November, and/or December in order to germinate the annuals that produce the showy mass displays. The amount in a single storm is also important. 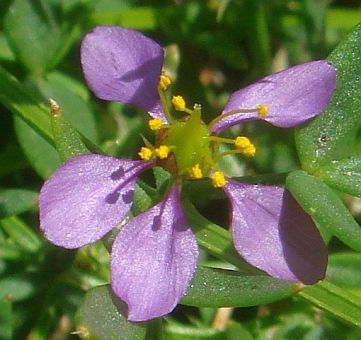 Native annuals require about an inch of rainfall, received over no longer than a period of something like several days, in order to germinate. Our native annuals have learned the hard way that any less rainfall doesn't guarantee enough moisture in the soil for them to produce seeds. Unfortunately, non-native annuals can germinate on less rainfall, and can sometimes get a head start over our native annuals if we get a first rainfall much less than an inch. 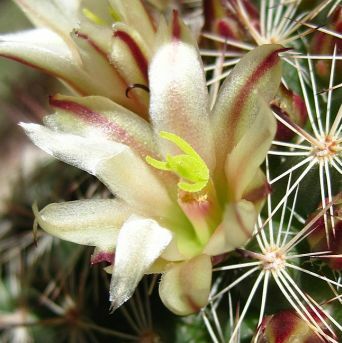 See Predicting Desert Wildflower Blooms - The science behind the spectacle from the Arizona-Sonora Desert Museum for information relating to Arizona desert blooms. Many of our annual species respond a bit differently, since we have much less monsoonal rain and more winter rain, but some of our species follow the Arizona rules. ... maybe one in five [springs] will bring a good wildflower display. 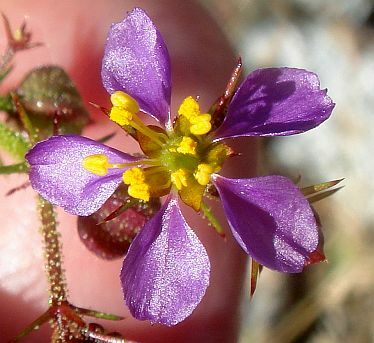 All bad springs are more or less alike in that wildflowers are scarce or not to be seen, but all good years are different in that no two have the same abundance of flowers or the same combinations of species. 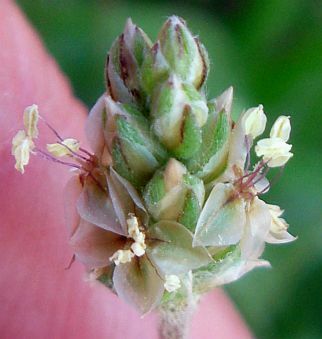 This is because different kinds of annual wildflowers have different requirements for germination and growth. This is just as true for the Borrego and Sonoran Deserts. 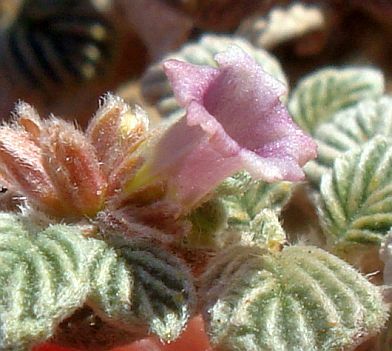 To the casual visitor to the Borrego Desert, it means the time period when there are carpets of showy flowers on the desert floor that will immediately be obvious in a large-scale photograph. As a result, this is also what the Park Staff means by Peak Bloom as well, and what is reported by them in the postcard notifications to those who sign up for that. 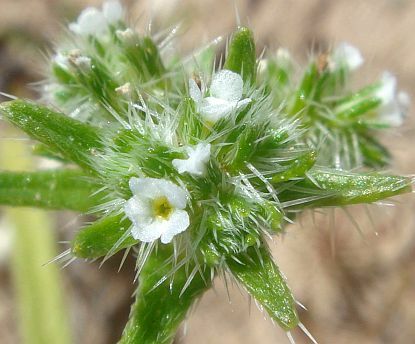 Only a few species produce those showy carpets of flowers, and the timing of their bloom does not necessarily correspond to each other, let alone the ~200 other species that bloom in February and March. 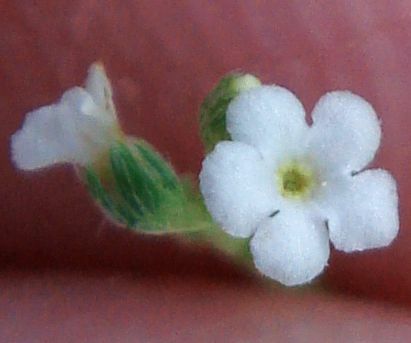 Note that other species can produce fields of flowers, but not in the sense of carpets of flowers. 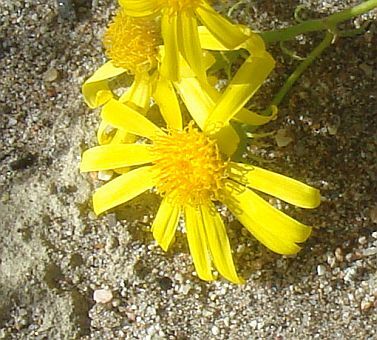 For example, brittlebush, Encelia farinosa, can produce very showy displays on hillsides long after the carpets of annuals are gone. 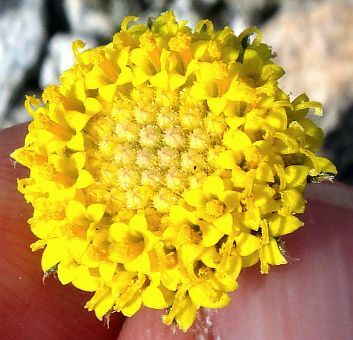 To a wildflower enthusiast, or a botanist, it might mean the time period when they can see the maximum number of species in bloom on a given one or two day trip. 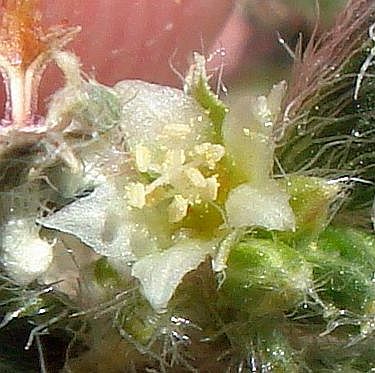 This in general occurs later than the time when showy carpets of flowers are present. 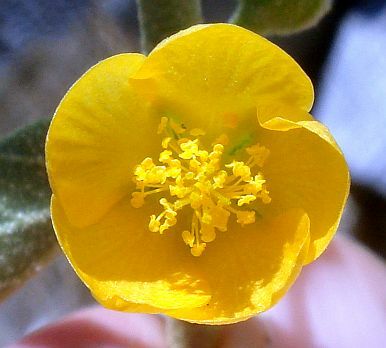 In fact, I have been in the desert at such a time of peak bloom, with perhaps 50 species in full bloom within a mile of my location, and had visitors ask me where the flowers are. Clearly, they were looking for carpets of flowers, and weren't interested in walking around to find all the species in bloom at that location. Most of the time, I use the latter definition of Peak Bloom, but I also try to mention when the carpets of flowers are present. 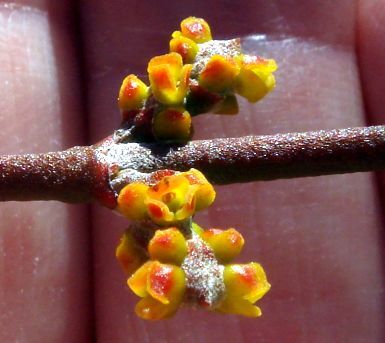 If you are looking for a particular species in bloom, the time of Peak Bloom doesn't matter to you; you want to know only when that species is in bloom. 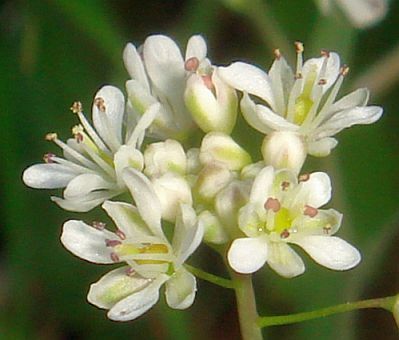 Plant species bloom at different times; it is not possible to see every species in bloom even over the time period of a month. 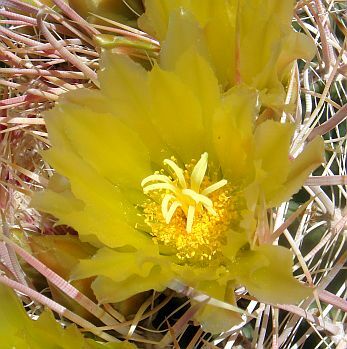 For example, if you want to see the beautiful blooms of beavertail cactus, Opuntia basilaris, you'll need to come just after the showy annual carpets are finished. 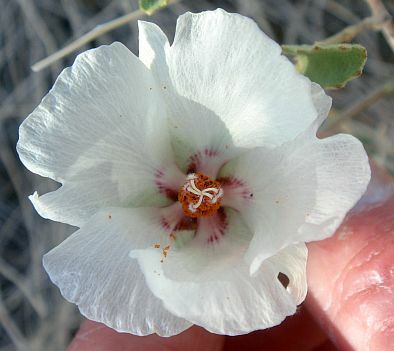 If you want to see the beautiful flowers of desert-willow, Chilopsis linearis ssp. arcuata, then you'll need to come here in summer, when few species are blooming except for it. See observed dates of peak bloom in 2008-2009 for various locations. 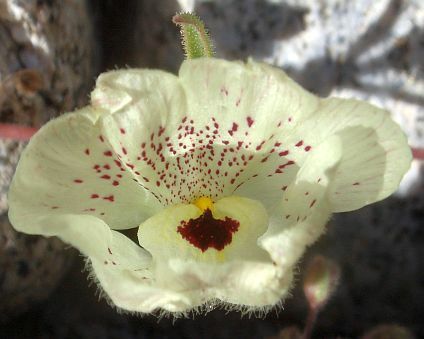 Other annuals can produce carpets of flowers, but are either more limited in their distribution, such as Bigelow's monkeyflower, Mimulus bigelovii, or purple mat, Nama demissum; or don't produce such showy displays, such as Fremont pincushion, Chaenactis fremontii (since fields of white don't show up well against the whitish background of the desert soil). 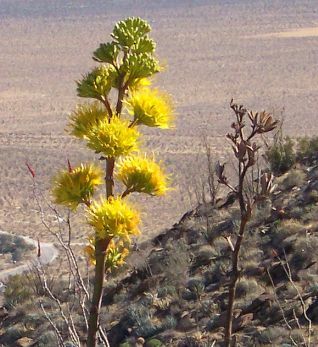 Peak bloom began on the desert floor ~23 February 2010, at elevations of ~1000 feet and below. 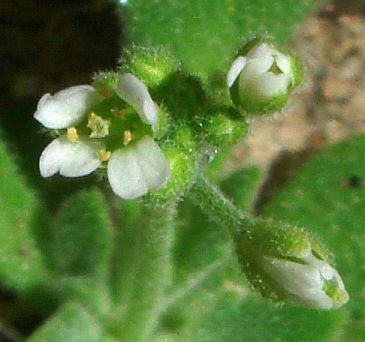 The first carpet of bloom is now present in many places along Coyote Canyon Road, the white carpet from spectacle-pod, Dithyrea californica. 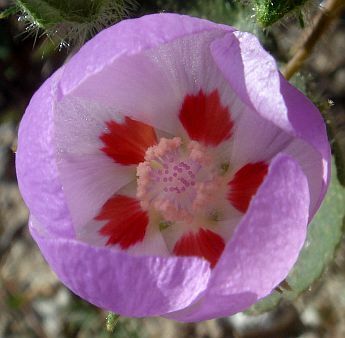 About 75% of the desert annuals have begun blooming, with the rest to follow in the next month. 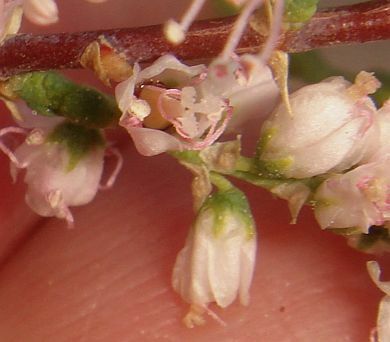 This is the exciting phase of peak bloom, where every trip reveals additional species blooming, and finds fields of bloom from species that only had a few individuals blooming just a week earlier. 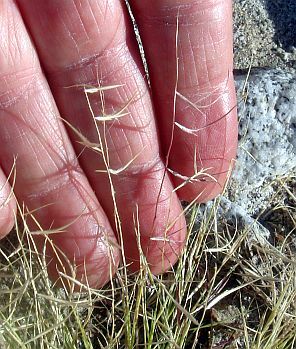 The widespread inch of rain on 12/7/09 produced excellent native annual germination west of Borrego Springs, but poor native annual germination in most areas east of Borrego Springs. 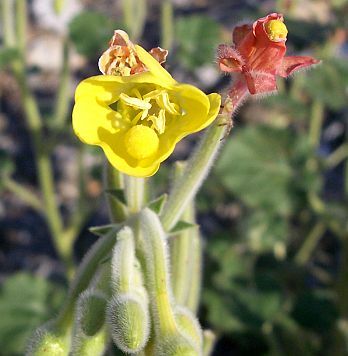 East of Borrego Springs, including the floor of eastern Clark Valley and Beckman and Fonts Point Wash in the Borrego Badlands, almost 100% of the germinated annuals from the early rains were the non-native Asian mustard, Brassica tournefortii. 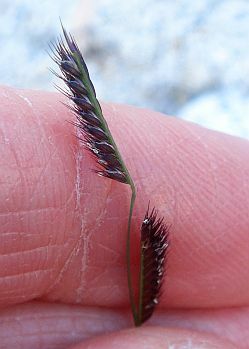 The January rains caused some native annual germination in those areas, resulting in very small plants as of 2/28/10. 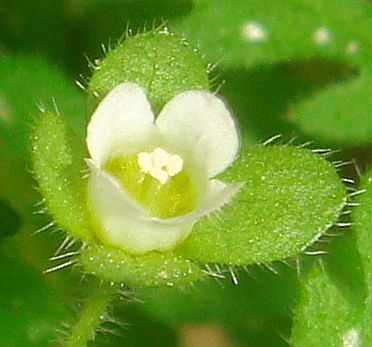 Many of the annuals blooming now are small plants, perhaps because they germinated in December instead of earlier, and / or because the temperatures since then have been cool, without any warm spells until after they started blooming. The perennials and shrubs are blooming beautifully this year from all the rain. end of paved portion of Di Giorgio Road (annuals): 23 February - ?. 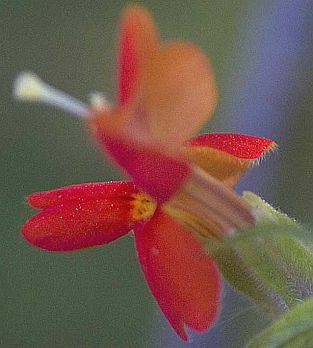 Coyote Canyon Road (annuals): 23 February- ? Canyons west of Borrego Springs (Hellhole, Borrego Palm Canyon, Henderson Canyon): ~5 March - ? For comparison, see observed dates of peak bloom in 2008-2009 for various locations. Detailed reports for the last two months are given here; for earlier reports, see Reports from 29 October 2009 to 24 January 2010. These reports are just summaries of these conditions from each hike. 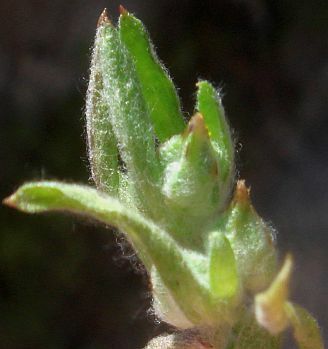 See also Detailed Germination, Growth and Bloom Reports From Each Hike in 2008-2009. 1/7/10: Hellhole Canyon to Maidenhair Falls. 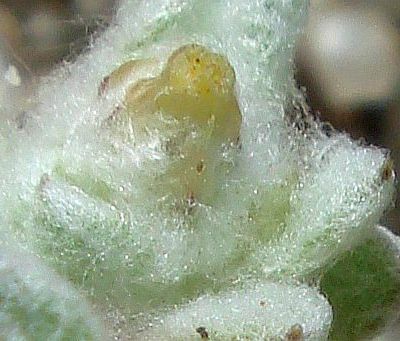 There is excellent annual germination in Hellhole Canyon itself, and decent germination underneath the shrubs on the alluvial plain below. 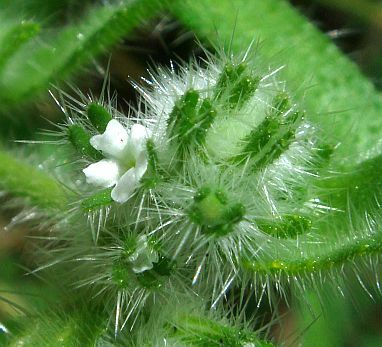 In particular, the Phacelia distans plants are growing robustly, with ~8 good-sized leaves or so on each plant. 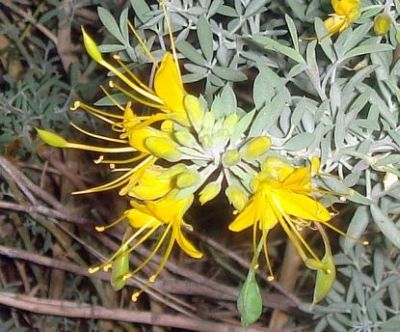 About ten plants of bladderpod, Isomeris arborea, are in good bloom. 1/10/10: Borrego Badlands: Fonts Point Wash and Beckman Wash. It was almost shocking to see the lack of native annual germination in this area. 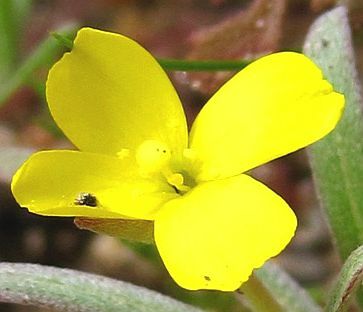 To a first approximation, the only annuals that have germinated here are those of the non-native Asian mustard, Brassica tournefortii. 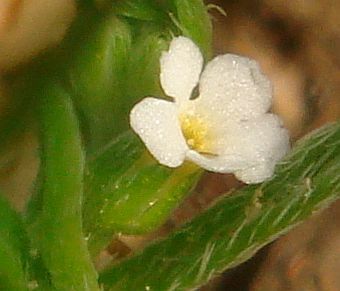 We only observed a few baby plants of narrow-leaved cryptantha, Cryptantha angustifolia, and a few other native annuals. 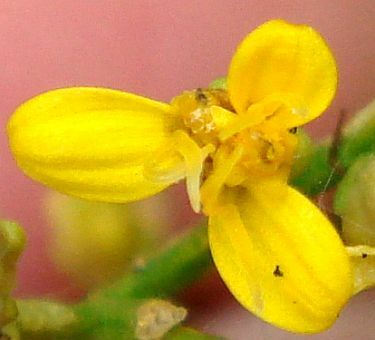 Worse, even if native annuals germinate later, they will be overwhelmed by the non-native Asian mustard due to its huge head start. 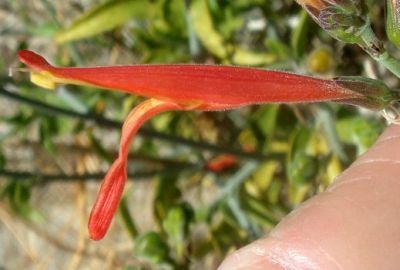 We observed rosettes of 3-4 leaves on several desert lilies, Hesperocallis undulata, but the last leaf reverted to a much-smaller size, indicating that it might be running of our moisture. That doesn't augur well for its good bloom unless we get further rain. As is often the case, the number of plants in bloom in the Borrego Badlands was way less here than we observed any place else so far this year. 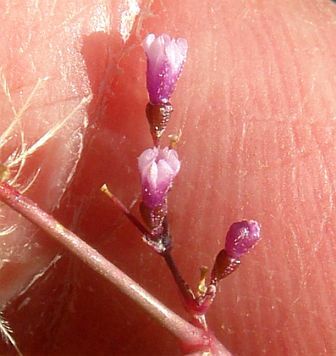 We found a grand total of 4 plants in bloom, each a different species. 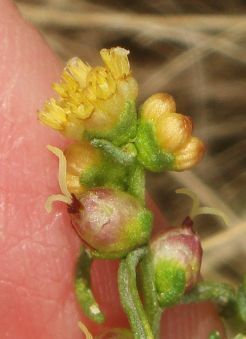 We also found a single plant on the S22 roadside of Salton milk-vetch, Astragalus crotalariae, with a number of buds. 1/15/10: Hellhole Canyon to beyond Maidenhair Falls. 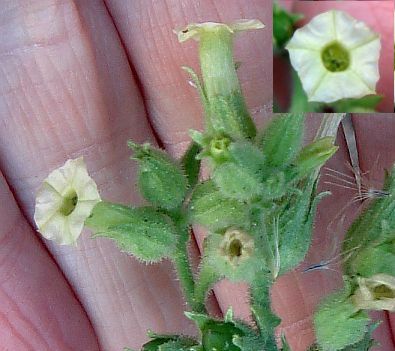 Conditions are much the same as on 1/7/10, with the annuals all a bit bigger. 1/24/10: Hellhole Canyon to beyond Maidenhair Falls. It rained! It rained a lot! This hike was delayed by six days due to a glorious five days of rain. Hellhole Canyon Creek is flowing quite strongly above the Canyon mouth; water is shooting down Maidenhair Falls; the ground is wet everywhere; and the annuals are looking great. 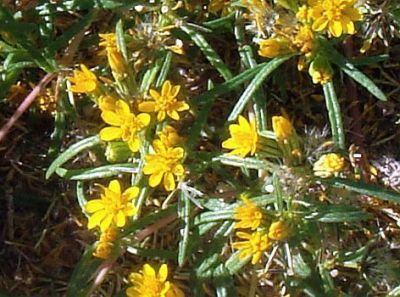 The annuals are no longer little rosettes with a few leaves in many places; they are now forming masses with foliage some distance above the ground. The widespread ~5 inches of rain here on 18-22 January guarantees a good wildflower display to come at least in this canyon. 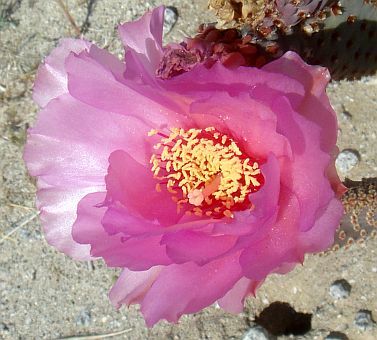 The stars of the show today were a few specimens of California fish-hook cactus, Mammillaria dioica, in full bloom along the portion of the trail in the alluvial fan, and the first few plants of desert apricot, Prunus fremontii in bloom (both pix by Mike Crouse). 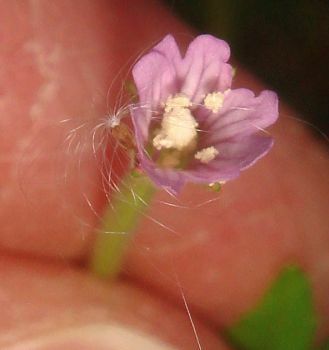 We observed three tiny plants of the first winter annual in bloom, but unfortunately the species was the non-native redstem filaree, Erodium cicutarium. 1/28/10: Borrego Palm Canyon: Palm Grove Loop. The biggest delight of the day was to quite unexpectedly see the rock crossosoma, Crossosoma bigelovii, in beautiful fragrant bloom. 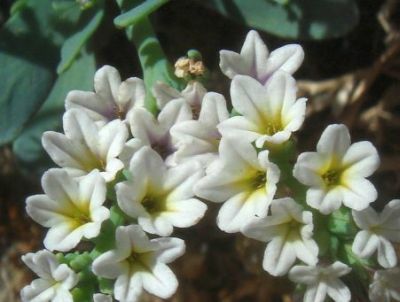 The scent was very strong and delightful, and the plants were beautiful, covered with bloom. 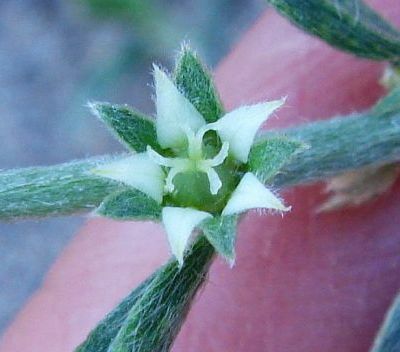 The first mats of annual flowers were present, but they were mats that only a serious botanist would notice. 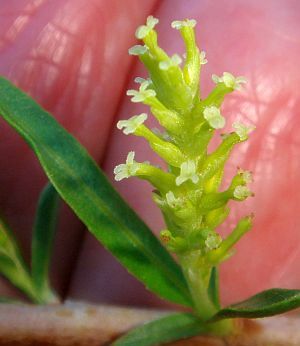 They were from the first flowers of curvenut combseed, Pectocarya recurvata, which has a minute flower, just ~1 mm (1/25 inch) across. 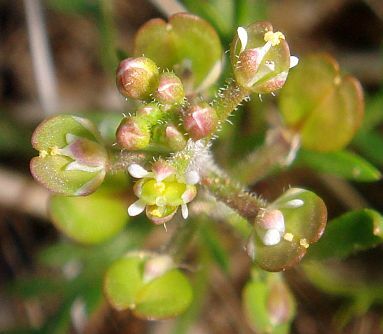 The other first-flowering mass annual here, hairy-podded pepper-grass, Lepidium lasiocarpum, was already showing its first fruit, along with what passes for flowers in this self-fertilized species. We spent considerable time verifying all the species on the plant trail guide, to see how many of the species seen in the glorious year of 2005 were present this year. 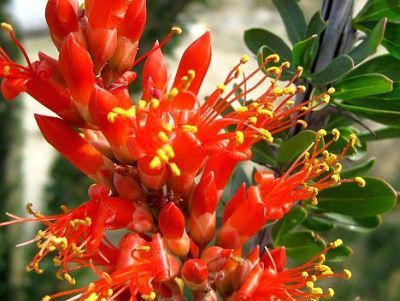 The variation is almost entirely due to annual species, since the perennials and shrubs stick around for a very long time. 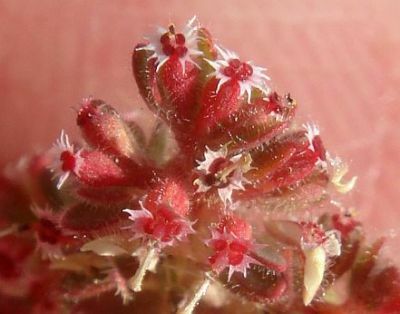 Nearly all annual species are present (of course, these were all babies, with few in flower yet). 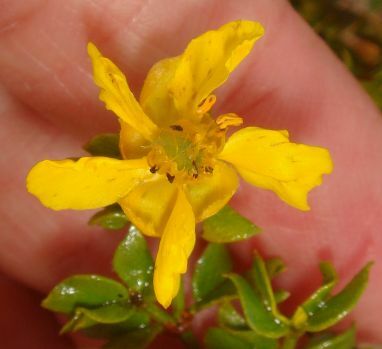 For example, in the first 0.02 mile of the trail, we found 18 annual species present, most in great abundance, with only three winter annual species seen in prior years not in evidence in this short stretch of trail (Lotus strigosus, Perityle emoryi, Camissonia claviformis). 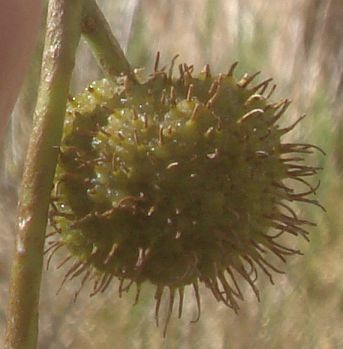 The latter two species were found later on the trail. 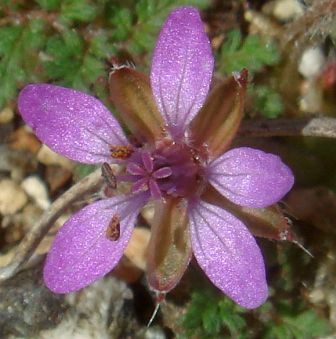 Most surprisingly, one of those 18 annual species, the native Texas filaree, Erodium texanum, had not been seen previously anywhere on this trail in 2003-2005! 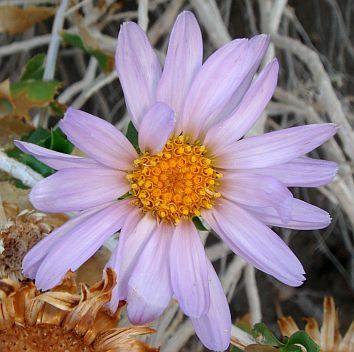 It is going to be a good bloom year in the canyons west of Borrego Springs. 1/31/10: Borrego Palm Canyon: Palm Grove Loop and above the first grove. 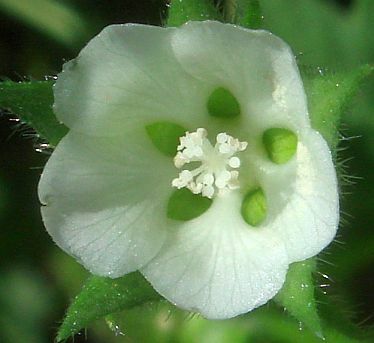 Three new species popped into bloom today: white fiesta flower, Pholistoma membranaceum; cheesebush, Hymenoclea salsola var. 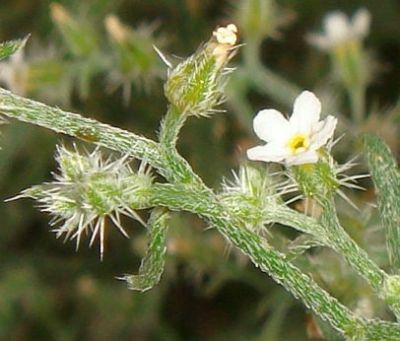 salsola; and deerweed, Lotus scoparius var. 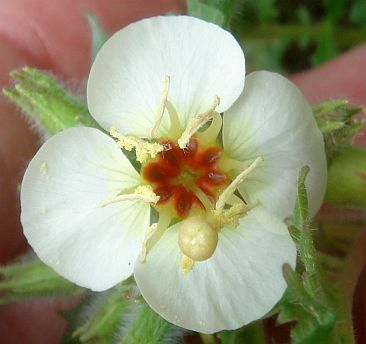 brevialatus, all represented by one to two plants or a single location. 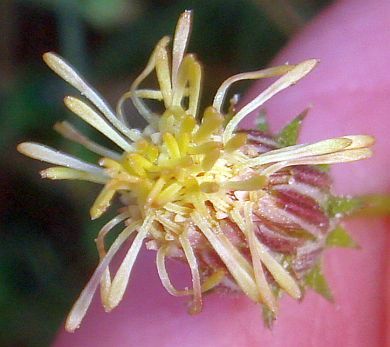 The fiesta flower was quite a surprise, since we saw it at the end of the day on the Alternate Trail, after previously seeing one zillion plants not yet showing any buds. 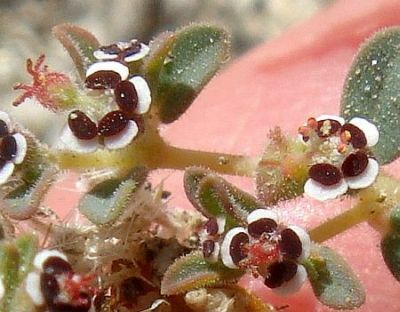 A number of plants in that one location were quite covered with bloom. 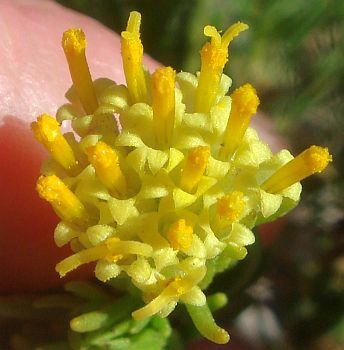 Cheesebush is nearly impossible to tell when it is in bloom by eye. 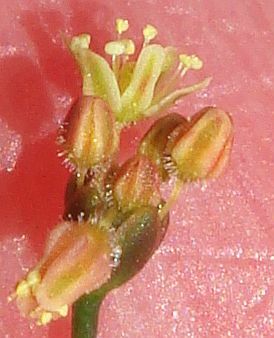 What most people think of as the flowers for this species are actually the bracts on the fruit. 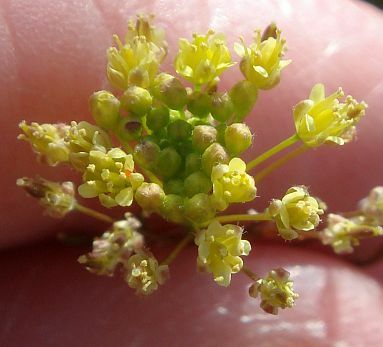 But the bees know when it is in bloom, so all we had to do to find the plants in bloom was to watch for the bees! 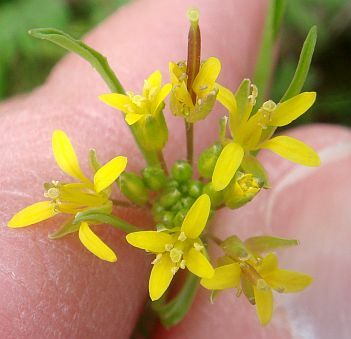 The Asian mustard, Brassica tournefortii, has begun to bloom in mass in several places on surprisingly tiny plants. I would have thought the abundance of rain would have led these plants to delay bloom while they grew more robustly, which is what 99% of the other plants of this species are doing. Keith Haworth speculated that maybe other nutrients were in short supply here, and I speculated that maybe these plants had already decided to begin blooming before the heavy rain of two weeks previously. But perhaps it was some other feature of this location not easily apparent to humans, just like the patch of fiesta flower in bloom. 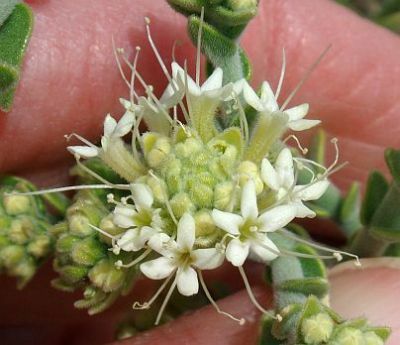 Overall, we found at least 491 total plants of 28 species in bloom, including four species not seen previously this season so far (the fourth one was common cudweed, Gnaphalium luteo-album, which had clearly been in bloom previously, but we had just not encountered it before this trip). 2/9/10: Borrego Palm Canyon: Palm Grove Loop and above the first grove. 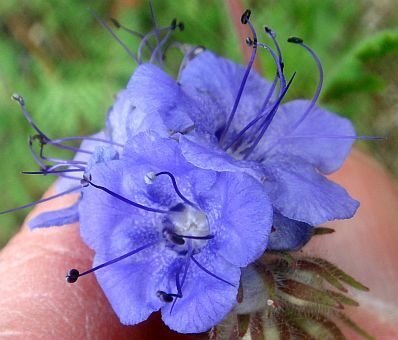 Eight new species were found into bloom today, including one of the stars of the annual show, Phacelia distans. 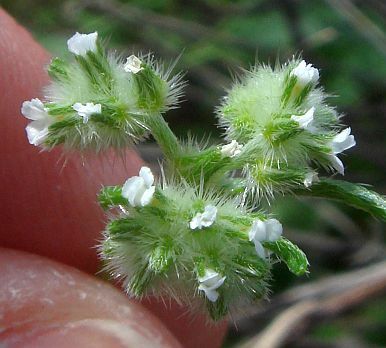 See the list below for the complete list of the species found in bloom here. 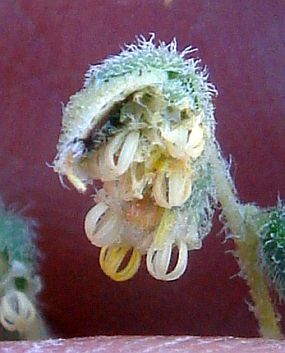 Many cheesebush plants are now in bloom, and some of them are beginning to produce their showy fruit that many mistake for their bloom. Many of the species in bloom here can be found right at the parking area, which would keep a plant photographer busy for some time without the need for any hiking. 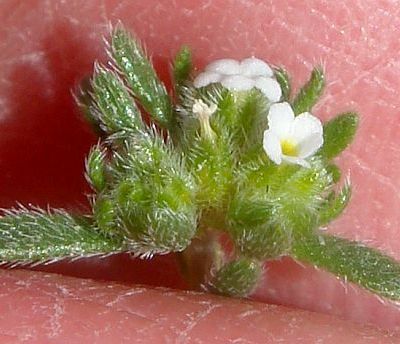 Surprisingly, many of the first annuals blooming now are very small plants, perhaps because they germinated in December instead of earlier. 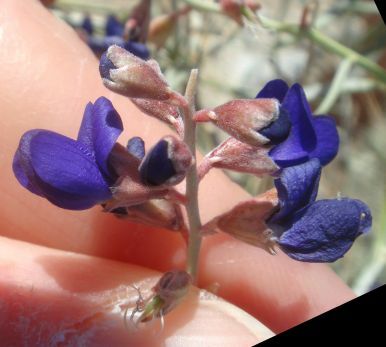 In the Canyon above the first palm grove, we were pleased to come across five plants of San Jacinto beardtongue, Penstemon clevelandii var. 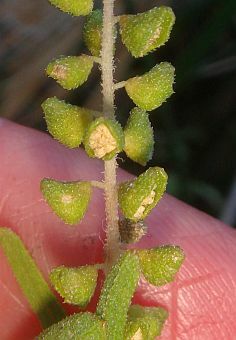 connatus, that had buds just about to pop. 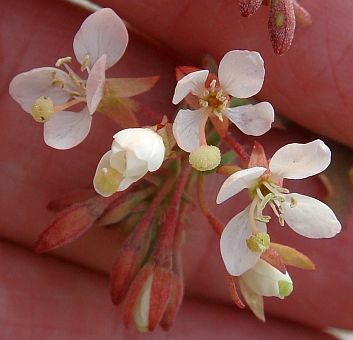 Altogether, we observed over 1,094 plants of 44 species in bloom today. 2/13/10: Little Surprise Canyon, Galleta Meadows, Henderson Canyon Road, Fonts Point Wash. This was primarily a one hour early-morning car trip to quickly survey some major bloom areas prior to a CNPS Orange County Chapter Pilostyles Tour I was leading at 11:00 a.m. At the end of the Pilostyles Tour, we then returned to Henderson Canyon Road and surveyed it more slowly. I was quite surprised at how few blooms I found. Little Surprise Canyon, up to just a bit beyond the split of the branches, had only five species in bloom, and two of them were non-natives. 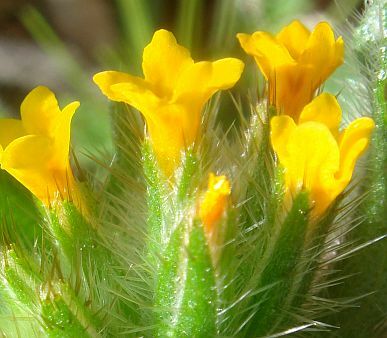 At Galleta Meadows, I found only three additional species in bloom, and they were very small plants, typical of many of the annuals I've seen in bloom so far this year. These plants clearly germinated too late to grow any bigger. 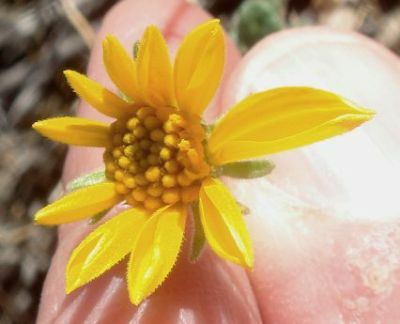 On Henderson Canyon Road, in the usual hairy desert-sunflower location, beside the huge dominance of the Asian mustard, Brassica tournefortii, there, there were a large number of young plants of hairy desert-sunflower, Geraea canescens. But they were far from bloom. 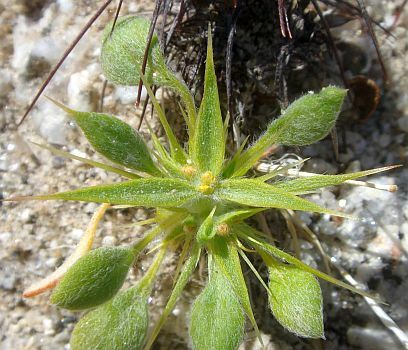 The largest were at least several weeks away from bloom, and there were a large number of very small plants with just a few true leaves that had clearly germinated only in the last several weeks. 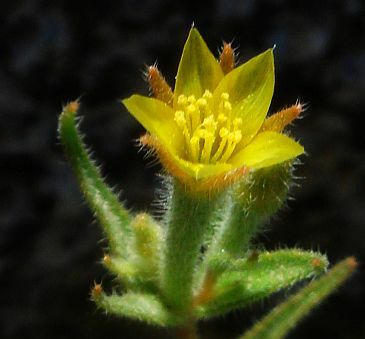 The best spot was just west of the Pegleg Monument, where the lowermost slope and base of Coyote Mountain had about ten species in bloom, including the very first flowers of desert star, Monoptilon bellioides; and yellow-head, Trichoptilium incisum; of the year. 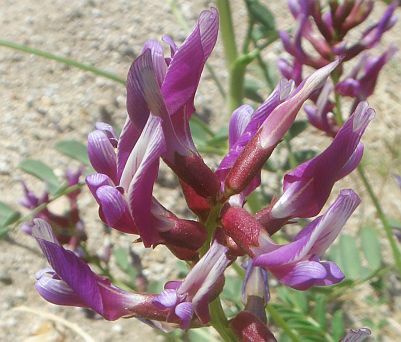 Near the Beckman Wash entrance along S22 west of Inspiration Wash, one glorious plant of Salton milk-vetch, Astragalus crotalariae, was in beautiful full bloom, due to the extra early water the road runoff provided. Fonts Point Wash was nearly devoid of life, let alone blooms. 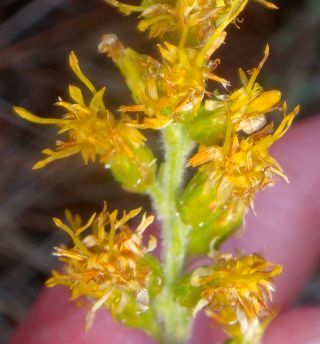 Most of the Pilostyles host plant, dyeweed, Psorothamnus emoryi; along with the burroweed, Ambrosia dumosa; were just beginning to leaf out! 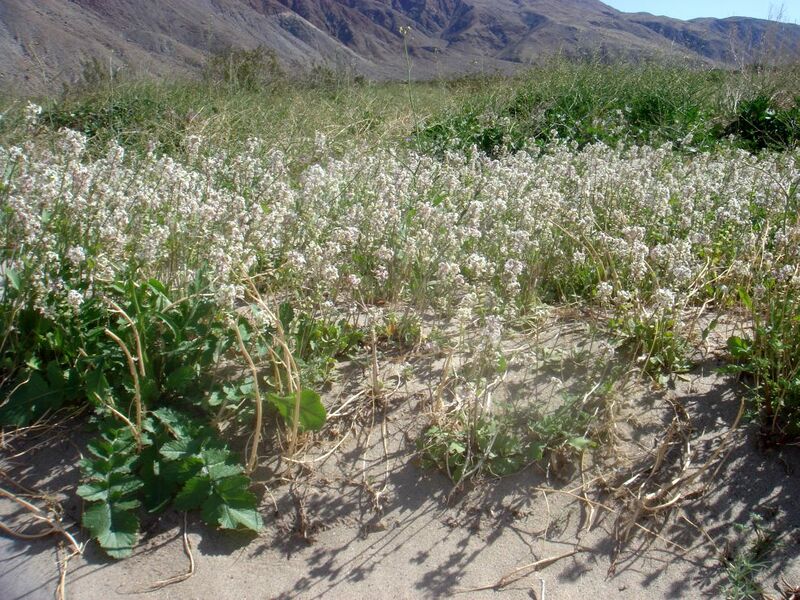 No native annuals were present in the wash at all. It is just astounding how this area could look like it was in a severe drought year, despite all the rain of the last two months here. 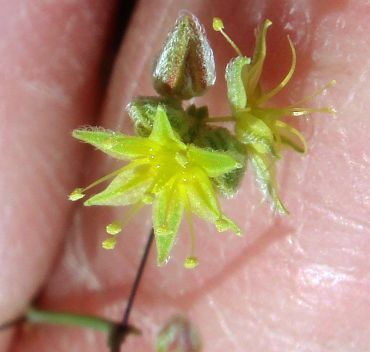 Overall, this mostly-car-trip found only 535 plants of 21 species in bloom, about half of what we found for both numbers in Borrego Palm Canyon alone four days earlier. 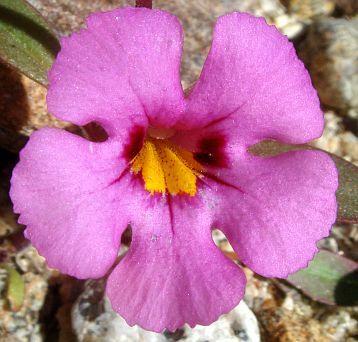 However, eight of these species were seen in bloom for the first time by me, since this trip was the first one of mine covering the desert floor for a while. 2/15/10: Borrego Palm Canyon: Palm Grove Loop and above the first grove. 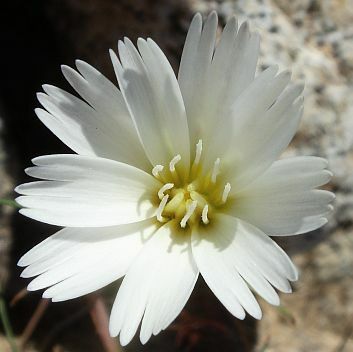 Nine new species were found into bloom today, including the first desert dandelion and first desert chicory along the Campground Road. 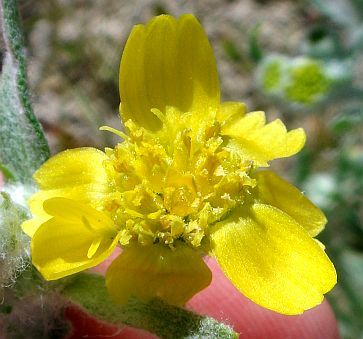 Parish's poppy, Eschscholzia parishii, has now joined small-flowered poppy, Eschscholzia minutiflora, in bloom along the Borrego Palm Canyon Trail. 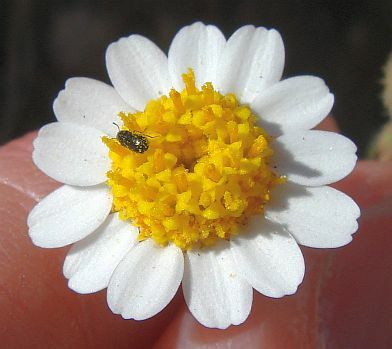 See the list below for the complete list of the species found in bloom here. 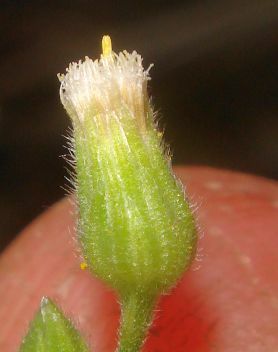 We continue to find that the annuals in bloom are very small. 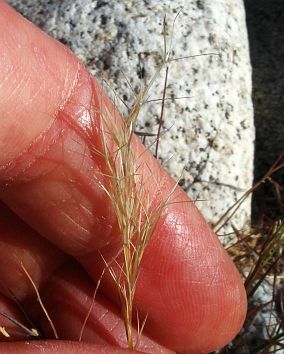 A dramatic example is shown by Mike Crouse's picture of hairy-podded pepper-grass, Lepidium lasiocarpum var. 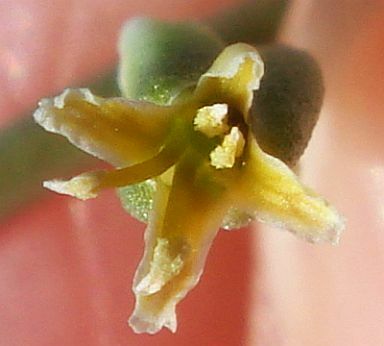 lasiocarpum, in bloom and fruit, with the tip of a ball-point pen (~8 mm = ~0.3 inches) alongside it for scale. 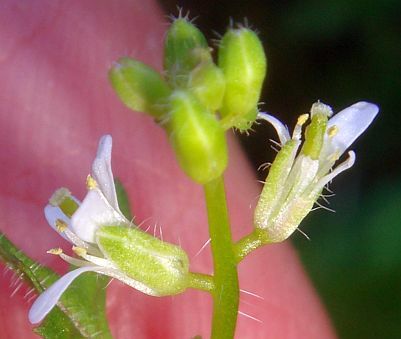 The entire plant is less than a half inch tall, whereas in good years it is ten times taller. Perennials and shrubs continue to bloom very well; they are the stars of the show this year. 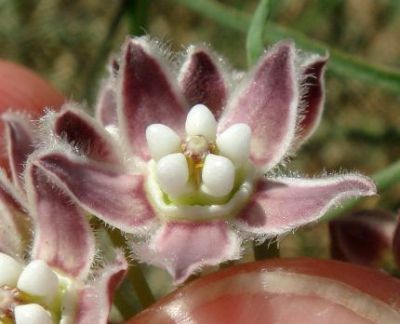 Don't forget the species with beautiful smells, too! 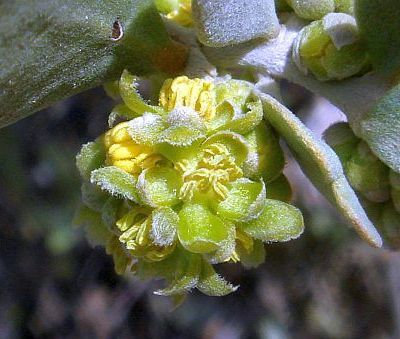 We came across several desert mistletoe, Phoradendron californicum, whose delightful fragrance we could smell from one hundred feet away or so. On the Alternate Trail, we smelled one that we couldn't even find. 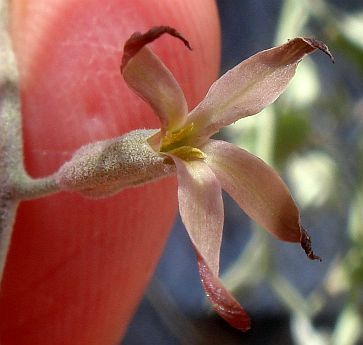 Rock crossosoma, Crossosoma bigelovii; and lotebush, Ziziphus parryi; also produce heady fragrances that make one wish just to hang around them to continue delighting in their fragrance. 2/23/10: Coyote Canyon Road; Alcoholic Pass Trail. 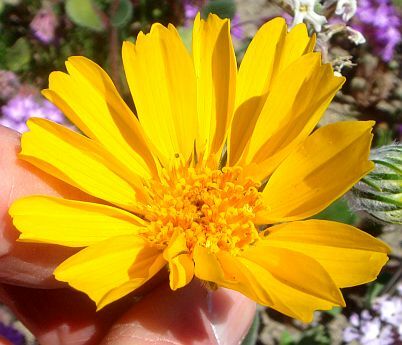 The eight days with temperatures above 70° from 12-19 February exploded the annuals into bloom. 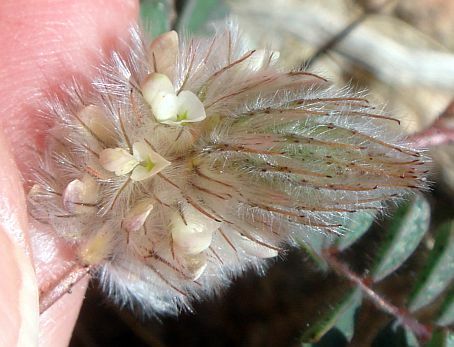 We found carpets of white along many places of Coyote Canyon Road from spectacle-pod, Dithyrea californica. 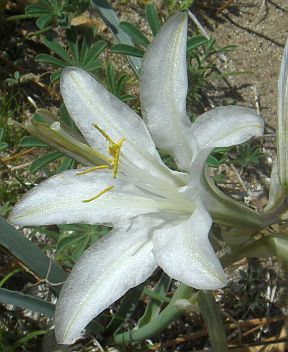 The other star of the show there is desert lily, Hesperocallis undulata, which has just begun to bloom in earnest there. They are joined by the beginning blooms of the other usual cast members of the annual wildflower show, who will be taking over from spectacle pod in the next few weeks. 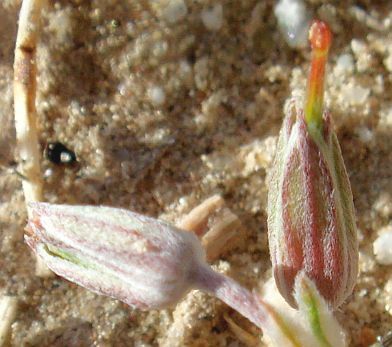 Although the spectacle-pod and desert lilies are good-sized plants, many of the other annuals are significantly smaller than normal, due to their late germination. 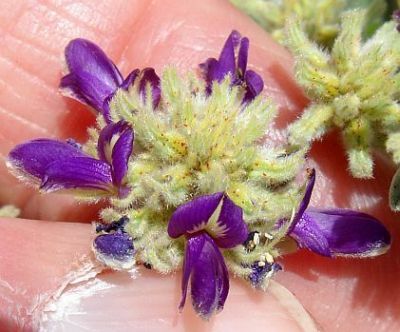 I was shocked to see how small the blooming plants were of Arizona lupine, Lupinus arizonicus, and narrow-leaved cryptantha, Cryptantha angustifolia. 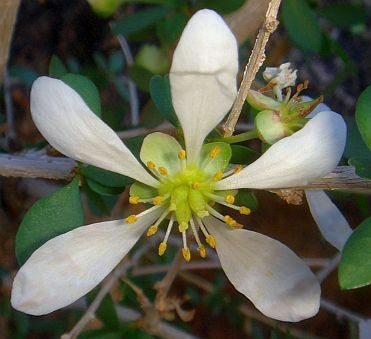 As always, the number of species in bloom at the end of the pavement along DiGiorgio Road is limited; I counted just 14 species in bloom there in a quick survey near the road. 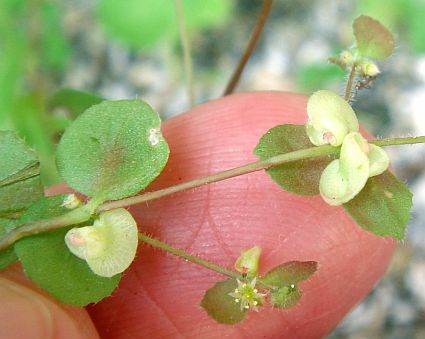 (Of course, there are lots of plants of each species!) 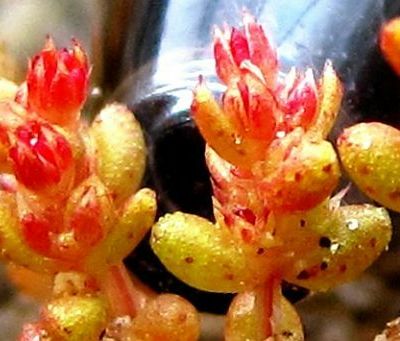 To find more species, one must explore different habitats. 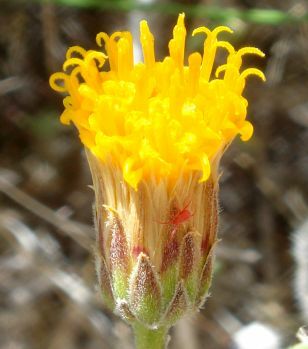 At the trailhead for the Alcoholic Pass Trail, we found an additional 16 species in bloom, mostly annuals. 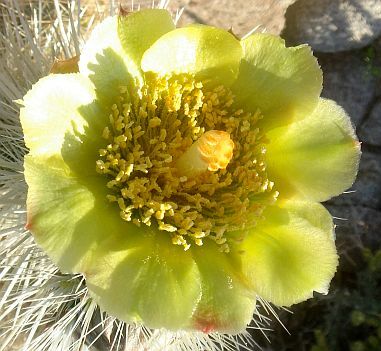 A hike along the trail found an additional 20 species in bloom, for our total of 50 species in bloom for the day. Altogether, we counted a total of 1,738 plants in bloom, allowing each species to count a maximum of 99 plants toward that total. 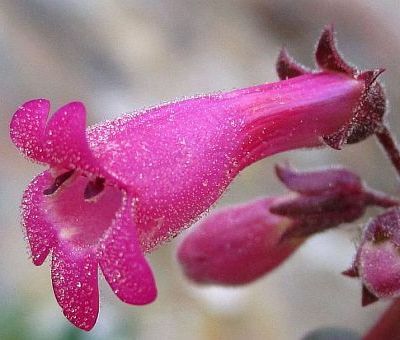 Although these numbers fall just a bit short of the more than 60 species per trip, and more than 2000 plants in bloom per trip, I doubt that anyone could tell the difference unless they were counting. Hence for all practical purposes, we are at the start of full bloom at elevations of ~1000 feet here. We looked for all the species in the plant trail guide for the Alcoholic Pass Trail. Most of course were present this year, but it was surprising that two annuals, abundant last year there, out of 25 total annuals seen near the trailhead, were not to be seen at all, or represented by very few individuals: star gilia, Gilia stellata; and hairy-podded pepper-grass, Lepidium lasiocarpum. Every year is different! 2/28/10: S22 (Montezuma Grade to Imperial County line); Henderson Canyon Road; Palm Wash in Imperial County. Near the bottom of Montezuma Grade, things were a-popping. For the first time, I had a sense that things were coming into good bloom there. 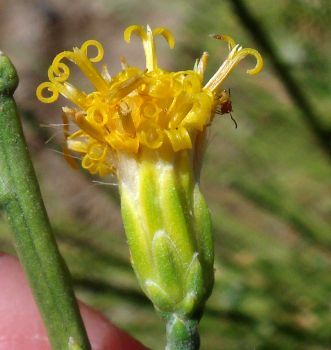 The ocotillos were all popping into bloom, the creosote and desert lavender, Hyptis emoryi, were noticeably in bloom, and the brittle bush, Encelia farinosa, were all clearly just about to burst into bloom. At the bottom of the grade the chuparosas were so covered with red flowers that it took me a moment to realize what species they were! 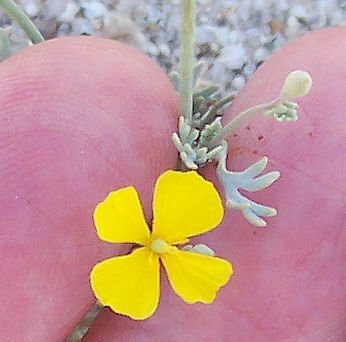 At Henderson Canyon Road, just west of the Pegleg Monument, there were decent displays of sand verbean, Abronia villosa, with some desert lilies and dune primrose, along with hairy desert sunflower, aka desert gold, Geraea canescens, just beginning bloom. The usual field of Geraea farther west has a smattering of blooms here and there, so this field is starting to pop. It looks like the display there will be much as last year, with some fairly solid patches of Geraea, amidst the overpowering dominant mustard background. 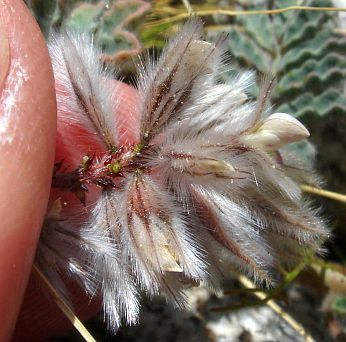 What really surprised me when we stepped out of the car there was how robust the Eremalche exilis plants were this year! As with everything else, there are two (to three) age classes. 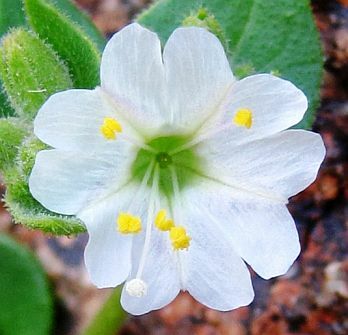 The oldest plants are HUGE, with zillions of small white blooms on them! Almost immediately after we headed east on S22 from the east end of Henderson Canyon Road, the annuals (except for mustard) stopped, and the desert looked like it was a very dry year, even though the ground is actually quite full of water. We then stopped at Coachwhip Canyon / Ella Wash, and I was stunned at the difference from almost exactly one year ago. I took some photographs to show the difference: View of west edge of coachwhip canyon at s22 on 2 March 2009 and View of same spot on 28 February 2010. Note the complete absence of annuals this year in the area on the left just below the middle of the photograph. Yet notice that the ocotillo in the background has its leaves this year, indicating that the ground is still quite moist there! 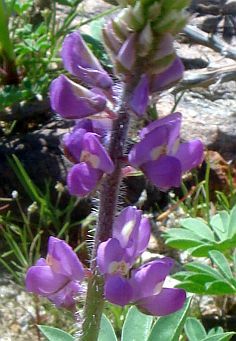 In 2009, the S22 roadside on the east of the canyon was so full of annuals that it took us about 30-60 minutes to find, photograph and write them all down. This year, it would take less than a minute to find and write down all the annuals at that location. The difference, again, is that the December rain wasn't quite enough to germinate the annuals here this year, and the January rain came too late to germinate many annuals. 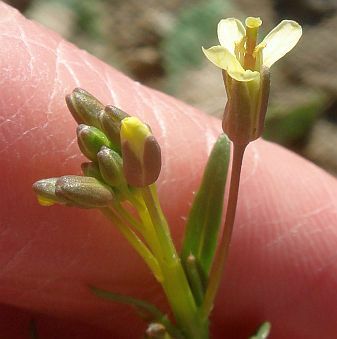 We surveyed for plants along S22 above Palm Wash ~1 miles east of the San Diego County / Imperial County line. 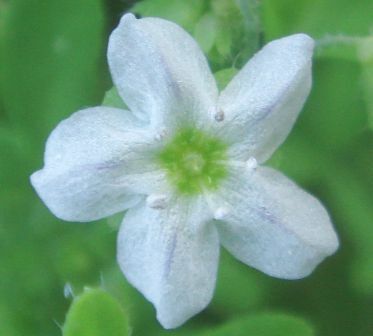 There were abundant annuals, but most were extremely small. Once again, there were two age classes of annuals here, with a small number of plants old enough to start blooming. In Palm Wash itself, we found a similar story. 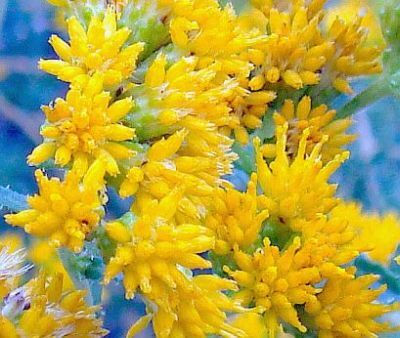 We were surprised, however, to find that the mustard plants were all wilting in one largish area, and it appeared to be because they were out of water. 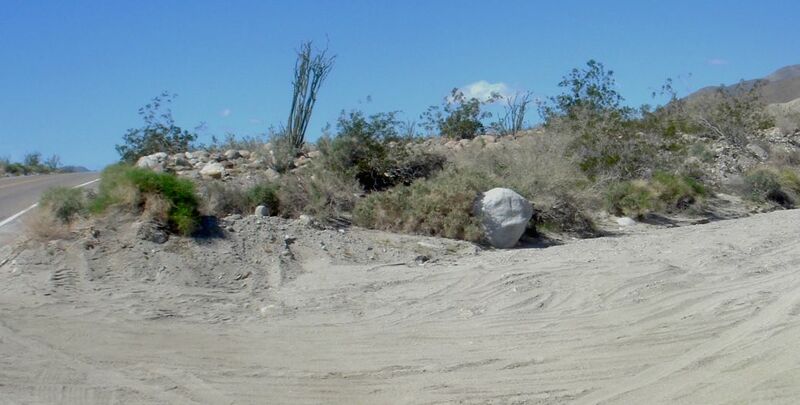 3/4/10: SR78; Elephant Tree Area just south of Ocotillo Wells. 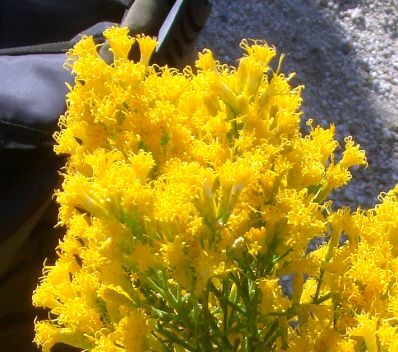 Beginning at around 1500 feet elevation at the Tamarisk Grove Campground, SR78 was lined with plants in bloom from all the usual suspects. 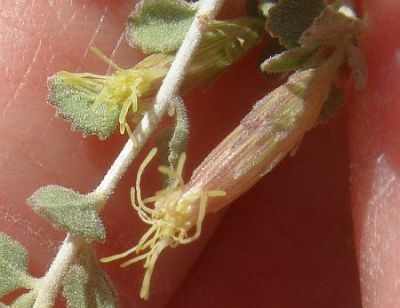 The bladderpod, Isomeris, plants were particularly noticeable from the car, covered with yellow blossoms. The Elephant Tree Area was the star of the show. 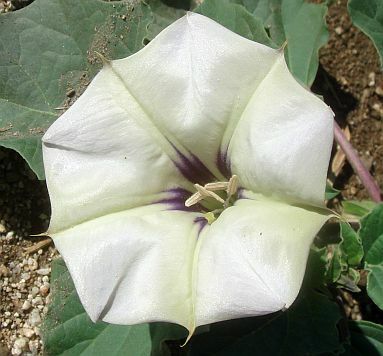 Perhaps because this area got September rainfall, and hence has additional (autumn) annual species such as Datura discolor not found elsewhere, this area has a huge total number of plants in bloom, using my system where each species contributes no more than 99 plants to the total count. 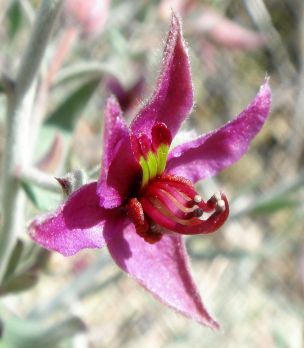 For the entire trip, including the car trip from the bottom of Sentenac Canyon, we found over 4,357 plants of 81 species in bloom! 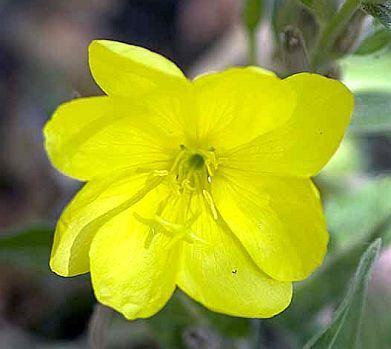 16 of those were species recorded in bloom for the first time this year, bringing the count to 172 species in bloom so far this year. 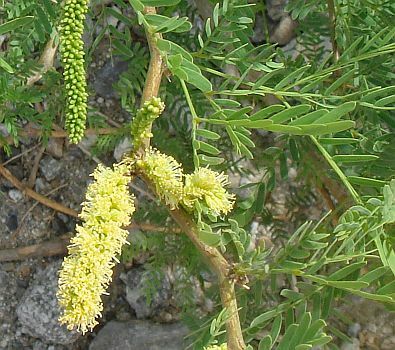 There were way too many species in bloom to go through them all here; see Table 4 below for the complete list of species in bloom, with counts of the number of plants for each species. 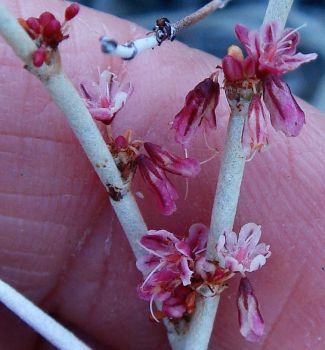 This is the fourth highest total for the number of species in bloom seen on a single trip since I've been keeping records in the last two years, and the highest total ever (in those two years) for the number of plants in bloom found on a single trip. 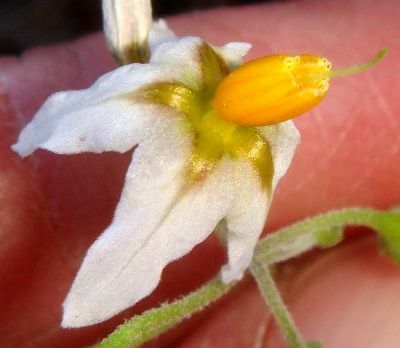 This shattered the previous record of 3,488 plants in bloom on 3/15/09. 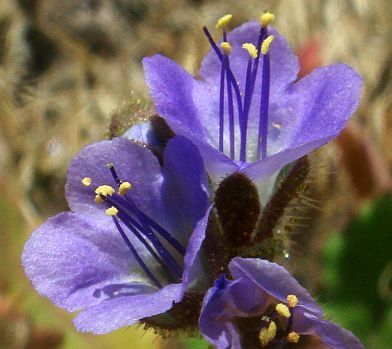 Just in the drive to the trailhead from Split Mountain Road, we commented on how beautiful the common phacelia, Phacelia distans, plants were that are in full bloom underneath many shrubs. 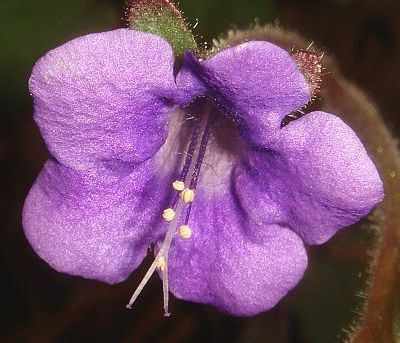 Its flowers here are an unusually-beautiful deep rich blue-purple, compared to just the usual blue elsewhere. At every turn in the trail, we came across new species in bloom. 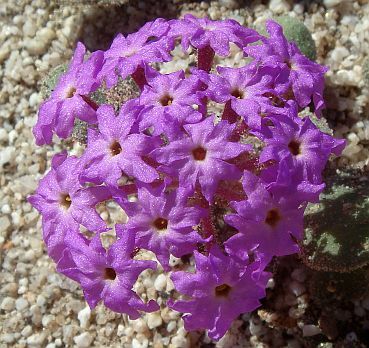 The desert at full bloom is such a delight! 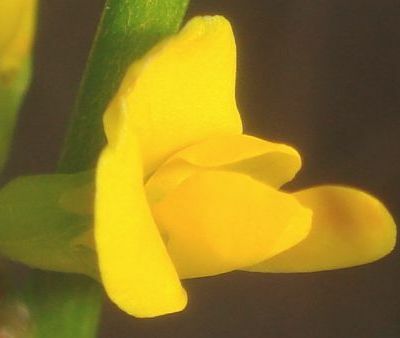 Most of the pictures in the Pictorial Gallery of Species in Bloom To Date in 2009-2010, organized by flower color, have been taken this year. The date and location of each picture are given in that table. 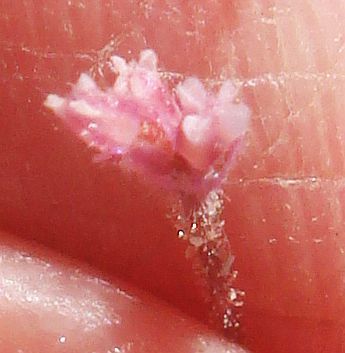 Most of the rest of my pictures were taken for scientific purposes, and not specifically to show anything about the bloom. 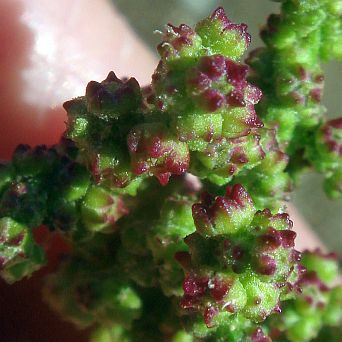 However, they may be of interest to people showing some aspects of what the bloom was like on a given date. My pictures are not even on standard webpages; Table 2 gives links to a directory and you have to click on the link for each picture to see it. 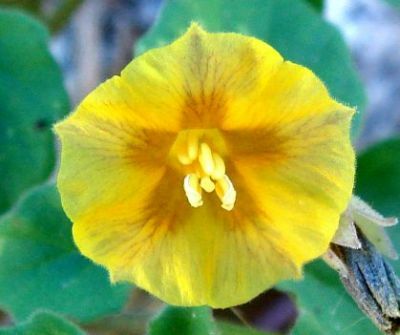 Scientific names are used almost exclusively for the picture names. 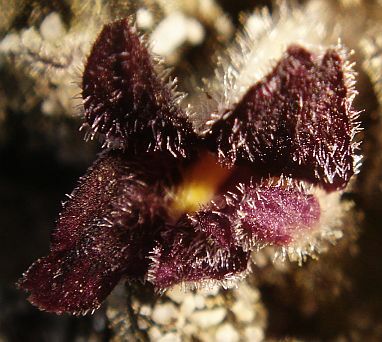 The context for most of these pictures is sometimes given in the botanical reports from each hike. See also Pictures From Each Hike in 2008-2009. 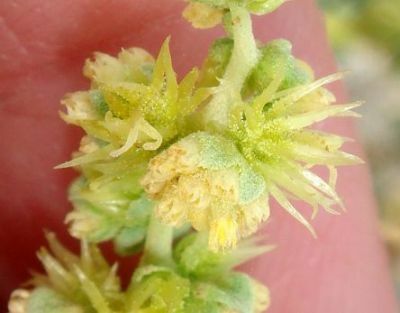 Past rainfall affects how big the plant is, and how many resources it has to keep blooming, especially the root system of the plant and how much moisture is available in the ground. Given enough resources, annuals can withstand conditions that would otherwise abruptly end the bloom. 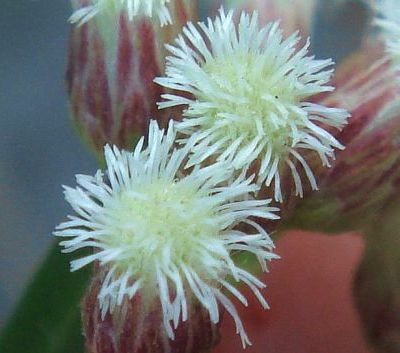 Future rainfall can allow a bloom to keep going even if resources are meager. 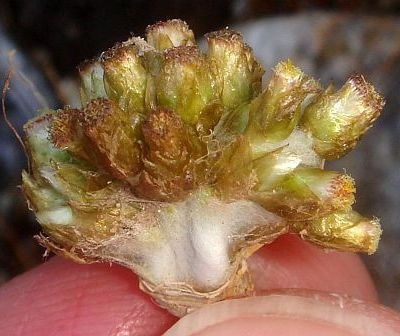 Even annuals near death can produce significant new growth if they receive rainfall. 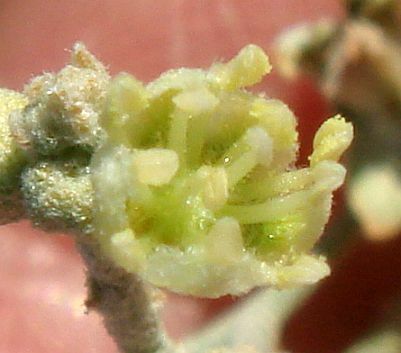 Heat is the main factor that terminates a bloom. I've seen a very robust February bloom abruptly end in just two weeks in March when 90° heat begins and is sustained for a few weeks. 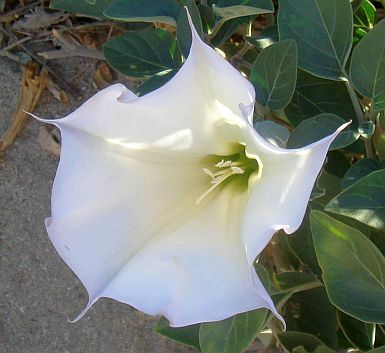 On the other hand, the bloom can go into April in years with cooler March temperatures. 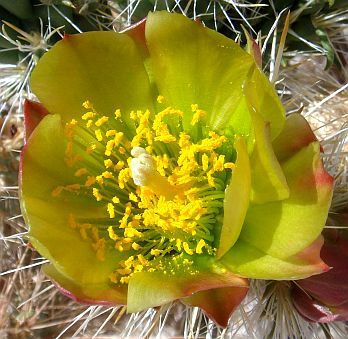 Peak bloom at elevations of ~1000 feet on the desert floor should continue for at least several weeks, through mid-March. Its end will come whenever the temperatures hit 80° or above for a week or two. 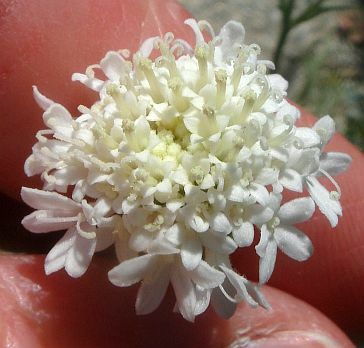 Peak bloom in the canyons to the west of Borrego Springs has just begun, and will probably last through the entire month of March. The first two plots, Figures 1-2, show what was observed on each trip, the total number of species in bloom and the total number of plants in bloom. 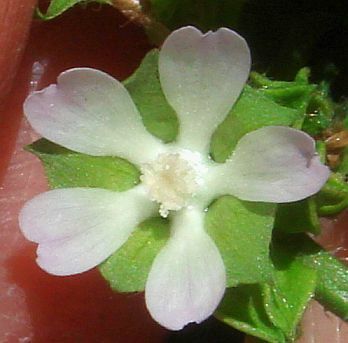 The total number of plants in bloom for each individual species is capped at a maximum of 99 plants. The next two plots, Figures 3-4, give the cumulative total numbers from all trips so far this season, of all species seen in bloom and of all annual species that germinated this year and have begun blooming. 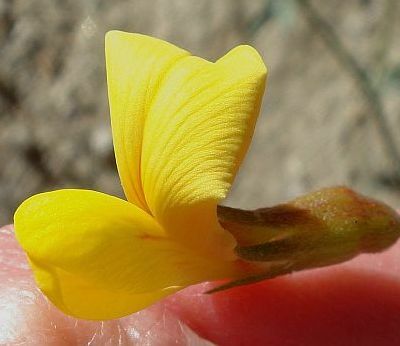 Thus this does not count any annual species that survived from last year and is now blooming. These cumulative total numbers include the number of species on a given trip as well as those from all trips previous to that trip. 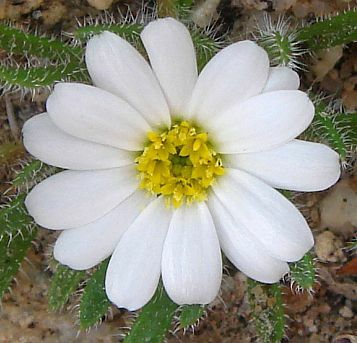 The last plot, Figure 5, gives the percent of the species that have bloomed so far that are annuals. 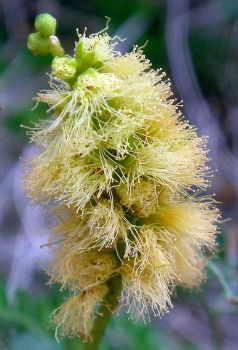 First, long hikes will find more plants in bloom than short hikes. For example, the hikes of 12/29/08, 1/2/09 and 1/9/09 were all in Henderson Canyon, but were 4, 7 and 8 miles long, respectively. 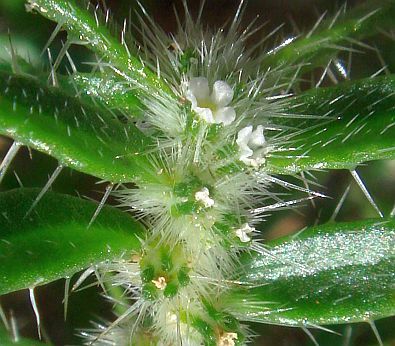 The increase in the number of plants was due almost entirely to the length covered. 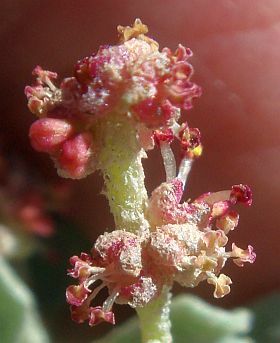 Second, some areas have a higher species diversity than others, and so will have more species blooming at a given time. 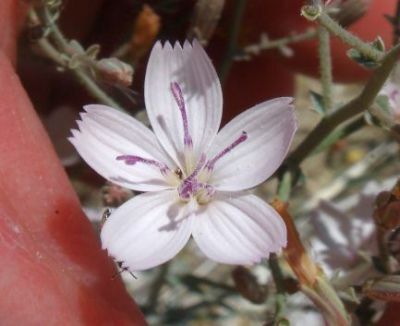 For example, on 2/20/09, I botanized the Borrego Badlands, which had significantly fewer species than the Coyote Creek area I had botanized for the previous two trips. 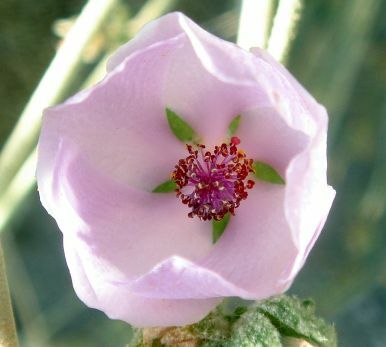 As a result, the total number of species observed in bloom skidded from 61 to 35, even though the bloom overall in the Borrego Desert was still getting better. 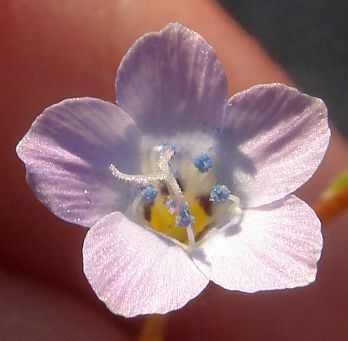 Note that the cumulative number of species, and annuals, seen to be in bloom from all trips that year continued to increase, since the Badlands had some species not found elsewhere. 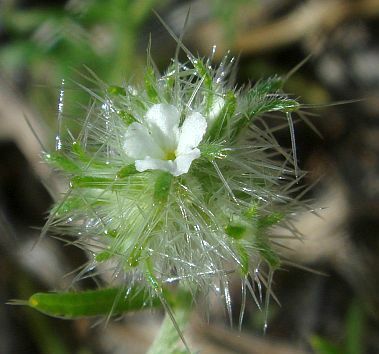 In 2009-2010, I began by botanizing the Coyote Creek Area, which had abundant water along the Creek. 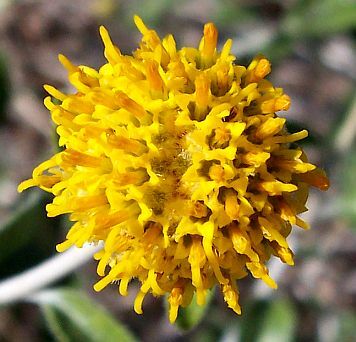 As a result, I found significantly more species in bloom than I did in 2008-2009, when I began by botanizing the very dry Clark Lake Area. 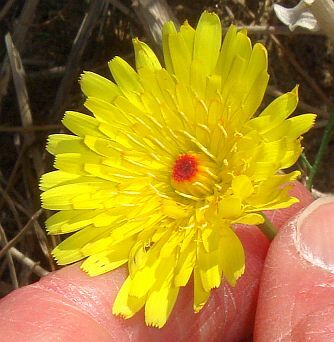 On 12/1/09, I visited an area that had received a summer thunderstorm on 5 September 2009, and as a result had many more species in bloom than anyplace else I visited in December 2008 or December 2009. 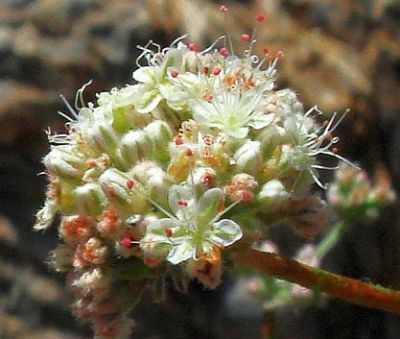 In fact, the number of species in bloom on a trip to Clark Valley on 12/19/09 produced almost exactly the same number of species in bloom as the 12/19/08 trip a year earlier. Table 3 gives the numbers used for the above plots, for the last two months. For earlier numbers, see Numbers from 29 October 2009 to 24 January 2010. 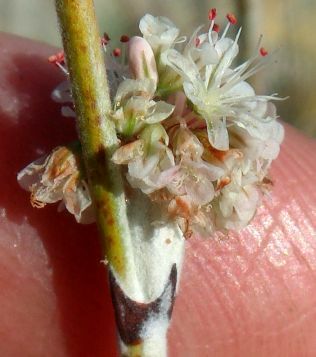 The individual observations used to obtain these numbers are in the List of Species in Bloom On Each Trip. Table 4 gives the number of plants observed to be in bloom for each species on each hike, with a maximum value of 99 plants for each species. 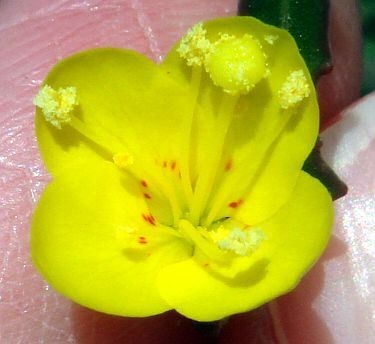 This maximum value prevents one species from dominating the total plants in bloom, and makes it much easier on me to keep track of the bloom. 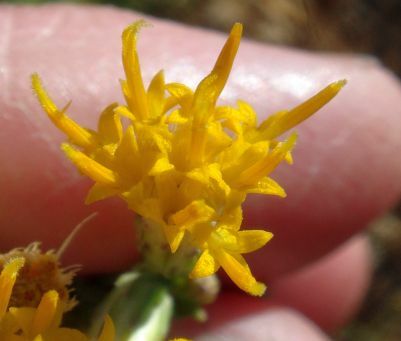 Because the hike locations vary, some species will not be present on every hike, so the lack of an entry for a given hike says nothing about whether that species is blooming elsewhere. 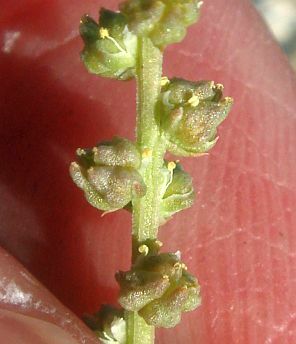 The Checklist is sorted first by category, with dicots before monocots, and then by family and scientific name. The Family and Scientific Name are from the Jepson Manual. 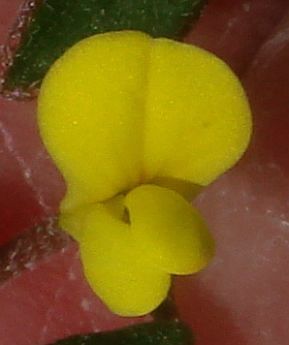 An asterisk before the Common Name indicates a non-native taxon. See Plant Family Abbreviations to obtain the full family name from the abbreviations used in the table below. 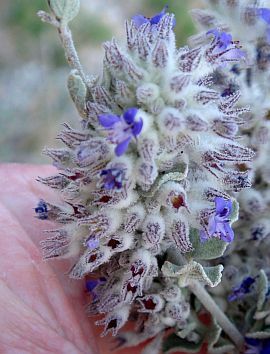 The Checklist has thumbnail photographs for most of the species, all of which were taken in the Borrego Desert. Clicking on the thumbnail photograph gives a larger version equal in size to the ones at the top of this page. 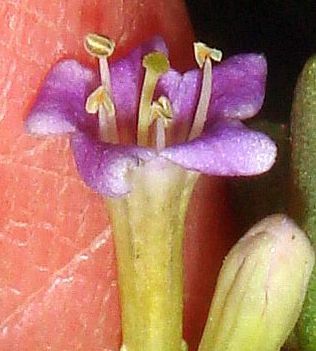 All the larger versions are also presented in Pictorial Gallery of Species in Bloom To Date in 2009-2010, organized by flower color. 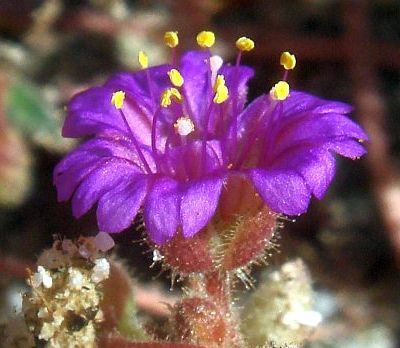 Mike Crouse contributed the pictures for Camissonia pallida, Crassula connata, Eschscholzia parishii, Fouquieria splendens, Mammillaria dioica, Mirabilis tenuiloba, Penstemon clevelandii var. connatus, Prunus fremontii, and Ribes indecorum, using either a Cannon Point and Shoot SD1100IS or SD1200IS. 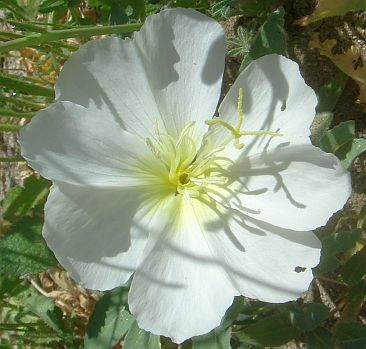 Bill Sullivan contributed the pictures for Oenothera elata ssp. 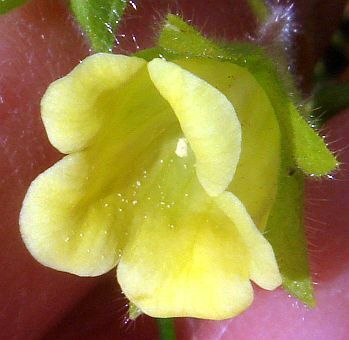 hirsutissima and Mimulus cardinalis. This table gives the number of plants in bloom only in the last two months. Some species thus have no number of plants in bloom listed in this table since they were observed in bloom only on trips prior to that date. 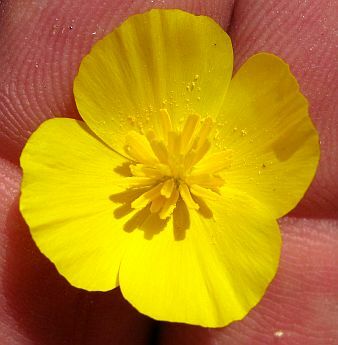 For those earlier trips, see list of species seen in bloom from 29 October 2009 to 24 January 2010.. 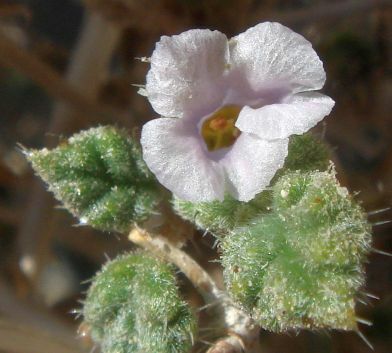 Some species that have bloomed in the Borrego Desert are not listed here, since I never observed them in bloom. 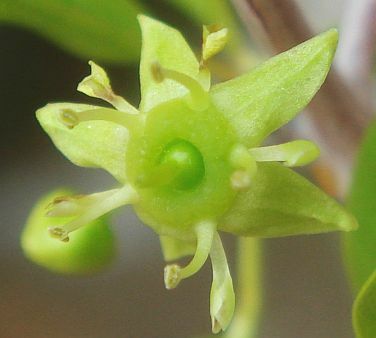 Such species are found only in a few locations, and I either never visited those locations or they bloomed in between my visits to their location. 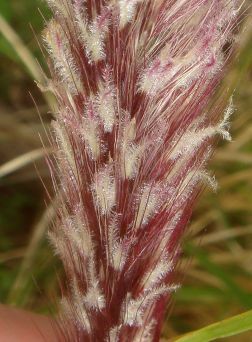 Of course, species that bloom later in the year, and species that do not have flowers (ferns, etc.) 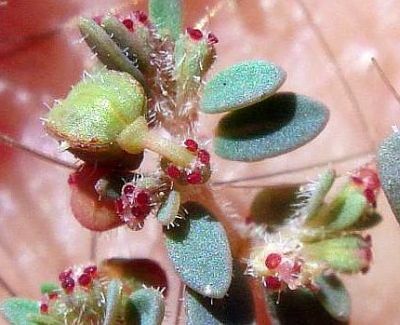 are not present in this list, so it is not the equivalent of a plant checklist for the Borrego Desert. 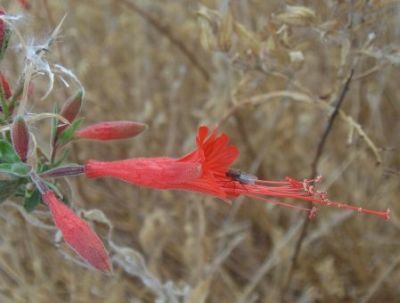 Anza-Borrego Desert Wildflowers: Where and When to Look and latest report (usually from Bill Sullivan) from the Anza-Borrego Desert Natural History Association. 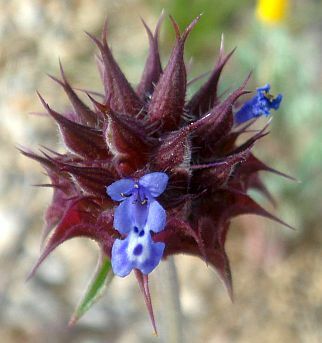 Anza-Borrego Desert State Park official site, with wildflower information on it. 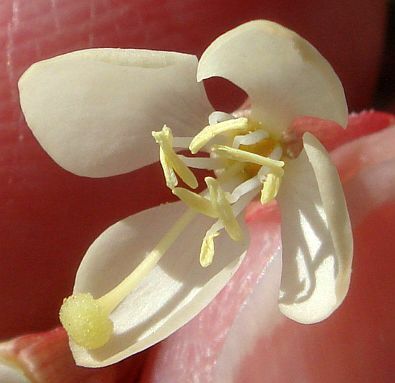 Click on the link near the bottom for the Flower Update and Map, which might be updated weekly. 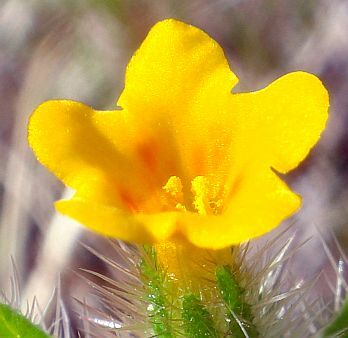 Anza-Borrego Foundation and Institute Wildflowers and their Anza-Borrego Desert State Park Wildflower Hotline: (760)767-4684. "Information on this recording is updated regularly." Copyright © 2008-2010 by Tom Chester.